You guys, summer is almost over! Okay fine…I realize that may be a bit dramatic, but this summer has literally flown by so quickly. For example, I have yet to float the river. For a Montana girl, that is a total travesty. But I’m determined to put an end to the sweet days of summer slipping from my grasp right here and now. Drive the 50-mile-long Going-to-the-Sun Road in Glacier National Park. Can I be honest with you? I have not driven the Going-to-the-Sun Road yet this year. Ooh, that feels good to get off my chest. In other news, I’m fairly certain that if I don’t do it soon I’m going to break out in hives. My most recent view from the Going-to-the-Sun Road, taken in 2013. Sigh. Side note: I heart Kjell. And I love the whole meaning behind flying with joy. Drive around Flathead Lake. One of my best drives in the summer can be found by making a complete loop around Flathead Lake, starting at Polson. 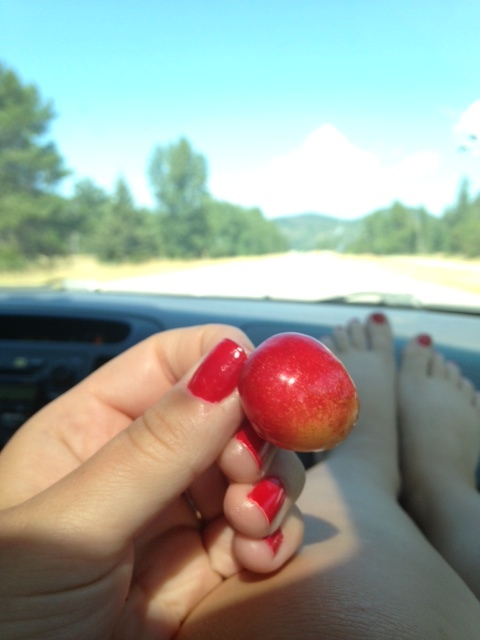 Be sure to stop by one of the local fruit stands and pick up perfectly ripe Flathead cherries. PS: Some of my other favorite stops include The Raven in Woods Bay and The Dock’s in Lakeside. 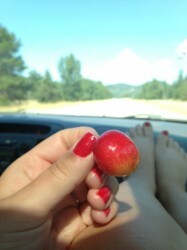 Munching on locally grown cherries. Kick up your heels at Missoula’s River City Roots Fest. This annual festival, held every year in August, basically offers the best of Missoula. Live music, eclectic people, local food trucks (yum!) and people cruising around on bikes. As a big music girl, it’s one of my favorite festivals. Float the Clark Fork River. One of the best things about summer in Missoula is the multitudes of people who hit the Clark Fork River in tubes. It’s one of the easiest and cheapest recreational opportunities in Western Montana. And I totally love it. That just leaves me with one question: Where should I meet you? This entry was posted in Uncategorized and tagged Montana, Play, Summer on July 29, 2014 by tiatroy.